A total of 111 Series have been contested, with the NL champion winning 47 and the AL champion winning 64. The New York Yankees of the AL have played in 40 of the 111 Series through 2015 and have won 27 World Series championships, the most Series appearances and victories of any Major League franchise. The Yankees have also lost more Series (13) than any other club. The St. Louis Cardinals, who represented the NL for a 19th time in 2013, have won 11 championships, which is the second-most among all 30 Major League teams as well as most among NL teams. Only the Giants have been NL champions more times, appearing in 20 World Series (14 in New York and six in San Francisco), with eight Series victories (second-most in the National League), including their most recent in 2014. 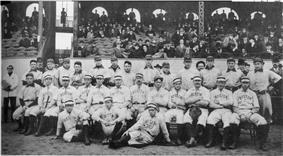 The Seattle Mariners and the Washington Nationals (formerly Montreal Expos) are the only current Major League franchises to have never appeared in the World Series; the Houston Astros, San Diego Padres, Colorado Rockies, Texas Rangers (formerly the 1961–1971 version of the Washington Senators), Tampa Bay Rays, and Milwaukee Brewers (formerly Seattle Pilots) have played in the Series but have never won it. The original Washington Senators, who became the Minnesota Twins starting in the 1961 season, played in and won the World Series in 1924. The Toronto Blue Jays are the only franchise from outside the United States to appear in a World Series, winning in 1992 and 1993. L1 The Brewers were in the American League from 1969-1997, after which they switched to the National League. L2 The Astros were in the National League from 1962-2012, after which they switched to the American League. ^ a b c d e f "Baseball-Reference Playoff and World Series Index". ^ "History of the World Series - 1904". ^ "Phillies Announce World Series Trophy Tour Presented by Teva Pharmaceuticals and Comcast SportsNet". PR Newswire Association. January 9, 2009. Retrieved January 1, 2010. ^ "White Sox Visit White House, Meet Obama". ^ Haft, Chris (November 1, 2010). "Giants win the Series! Giants win the Series!". Major League Baseball. Retrieved November 1, 2010. ^ "Brewers switch leagues, join Reds in NL Central".